Ssshhhhhhhh....can you hear it? It's the song 'Hot Hot Hot' - which could have been our theme song this month. 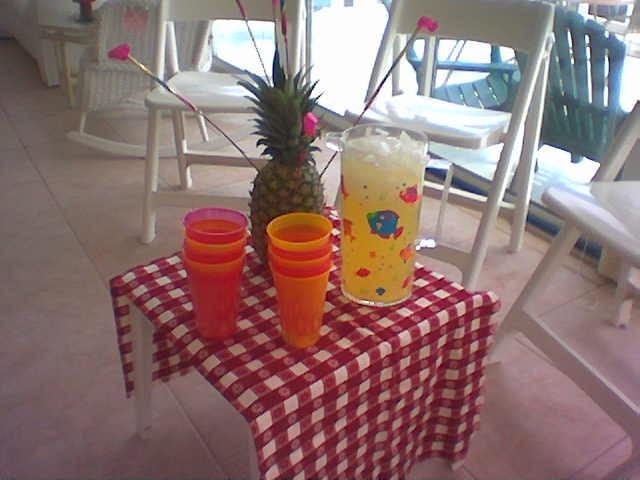 My accomplice, Grace and I greeted all the guests with a Pineapple "Sparkler" - a 'refreshing' choice in Bonnie's words. In the theme of grilling, I decorated with plaid tablecloths and bandanas. The first choice for the ladies was whether to start with the 'Cantaloupe Gazpacho' or 'Tomato Gazpacho'. The grilled portion of this dish was the 'Spicy Seared Scallops' that accented the chilled soup on wooden skewers. I served a snapper dish that can be cooked in a tinfoil packet on the grill and served on a bed of greens. I don't have a picture of the dish, but I have a picture of everyone enjoying their meal. 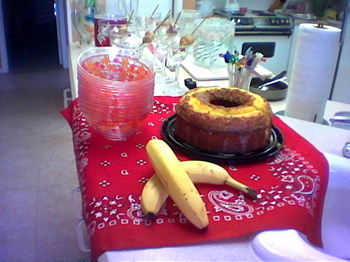 Finally, we ended the luncheon with 'Calypso Bananas Flambe'" over Louisanna Crumb Cake. A big thank you to my guest, Linda Lance, for her helping hands and a hostess word of caution....Don't serve wine from a scallop bowl - it can tip over! In food processor or blender, puree the garlic, sugar, cayenne and bread. Trim away any tough watercress stems or remove the tick spines of the romaine leaves. Add watercress or romaine to the work bowl. Add the vinegar, oil, basil, and beef or vegetable broth. Transfer to another bowl and stir in tomatoes and V8 juices. Prepare a medium-hot fire ..
Set aside for 15 minutes, then thread 4 scallops onto each skewer or cook directly on the grill. Brush grill grate w/ veggie oil. Slide them off skewers and top them with gazpacho. In a medium bowl, combine the vegetables with the olive salad, garlic, Italian seasoning, 1 teaspoon of the salt, and 2 tablespoons of the olive oil. Mix together to combine. Season the fish generously on both sides with the Emeril's Original Essence. Fold each piece of aluminum foil in half. Open each folded piece and place 1/4 of the vegetable mixture just below the crease and in the center of each foil square. Place a snapper filet on top of the vegetables. Drizzle each fillet with 1/2 a tablespoon of lemon juice and 1 tablespoon of the olive oil. Fold the foil over the fillet and tightly crimp the edges to form a seal. Place the pouches on a sheet pan and place in the oven to bake for about 25 minutes. While the fish bakes, in a large mixing bowl, combine the frissee, baby spinach, endive and red onion. Season the lettuce with salt and cracked black pepper, and toss to combine. 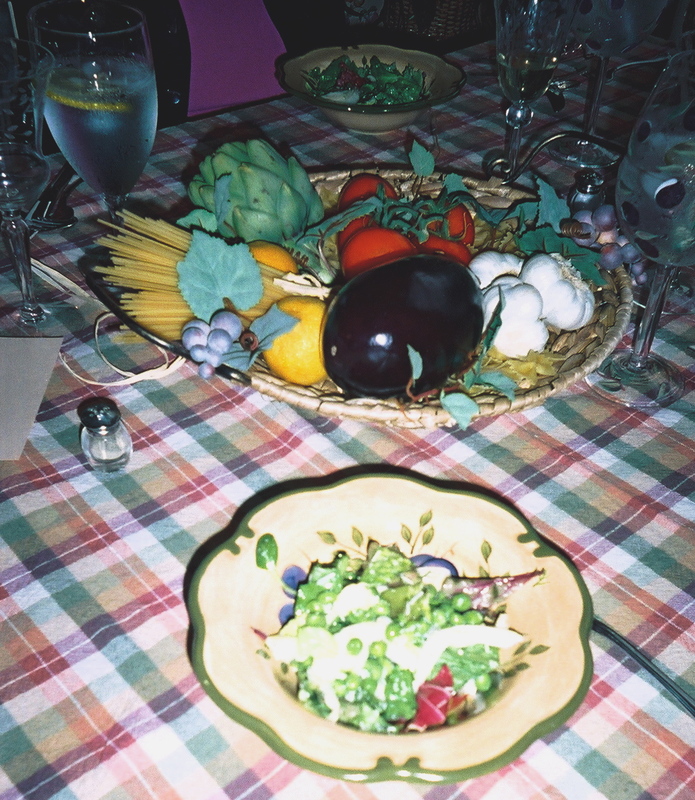 Divide the lettuces among 4 entrée plates. Remove the fish from the oven. Combine the shallots, vinegar and mustard in a medium bowl set over a plate covered by a dishtowel to prevent the bowl from moving while whisking. Whisk the mixture while gradually adding the remaining 1/3 cup of the olive oil. 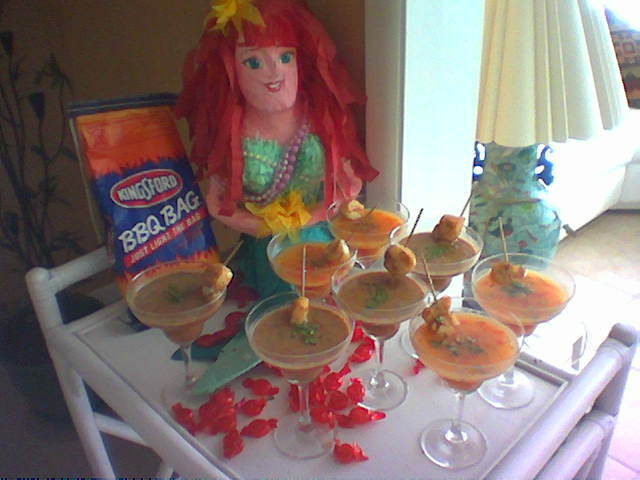 Gently pierce each fish packet and whisk the juices into the vinaigrette. Season the vinaigrette with salt and pepper. Place the fish and vegetables over each salad. Divide the vinaigrette evenly over the 4 salads and serve immediately with crusty bread. In a small bowl combine sugar, melted butter, lime juice, and cinnamon. Brush bananas with about 1/4 cup of butter mixture. Place bananas on center of cooking grate. Grill 2 to 4 minutes, turning once halfway through grilling. Slice grilled bananas and place slices in a flameproof dish. Pour remaining 1/2 cup butter mixture into dish. Place dish on center of cooking grate. Cook 5 minutes. Remove dish from grill. Quickly pour rum over bananas. Light rum with long kitchen matches. After flames die out, serve immediately over ice cream. Note: For another tropical treat, you can substitute 2 semi-firm mangos for the bananas. Peel and cut into 1-inch thick slices. 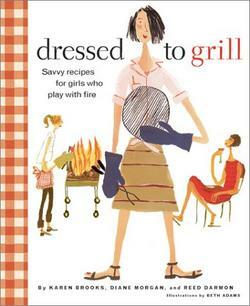 Nancy Lindsey, was our Hostess and Chef Extraordinaire for the March Luncheon and was inspired by this book. As you will probably notice, the book is not actually a 'cookbook' - although it does contain recipes. It was just the inspiration point for her wonderful meal. 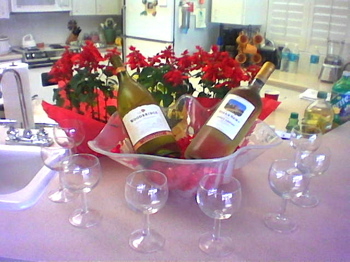 To set the mood, we were graciously greeted at the door with an aperitif. We met briefly in her living room to discuss her inspirations and menu. After being seated, her first course was was the 'Antipasti' platter. 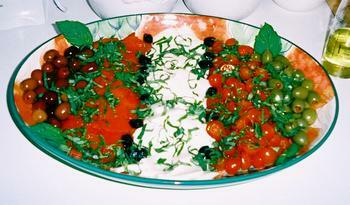 This beautiful dish was served with crustini. Our next course was homemade linguini with a chicken and artichoke sauce that was simply delicious. I think the consensus is that the pasta maker should come down off the shelf more than once a year. What a treat to have fresh pasta! And although Americans may not be familiar with enjoying the salad course after the main meal, it was served this way at Nancy's luncheon. The fennel and sweet peas were the perfect combination. 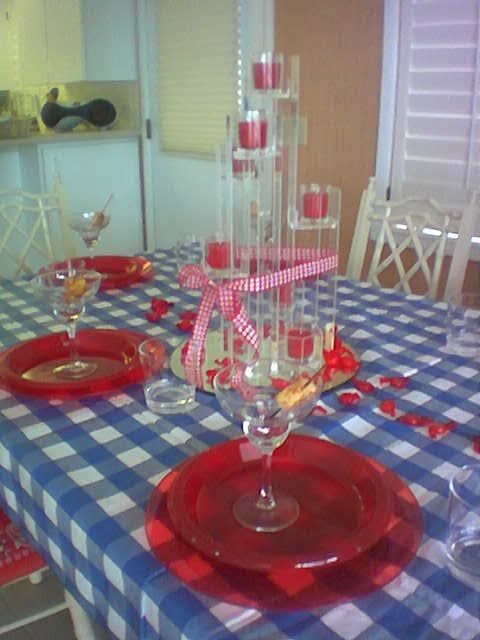 Plus the centerpiece just made me want to pour a bellini and go stomp some grapes. To complete the meal, she finished with baked peaches and brown sugar. "Live Spherically" and Grazie per il pasto squisito. Cook oil, butter, flour, and chicken broth until it thickens. Add garlic, artichoke hearts, lemon juice, and cheese. Continue cooking until flavors blend (about 5 minutes). Add capers and parsley. To cook the linguini: Bring 6 quarts of water to a boil in a large pot. Add 1 Tablespoon olive oil and 2 teaspoons salt. Add the linguini and keep boiling until tender but firm (al dente), 8 to 10 minutes. Drain pasta and immediately toss with artichoke sauce.